Controls: arrow keys to move, Z to jump to the other open space. Mouse also works. This is a sliding block puzzle. 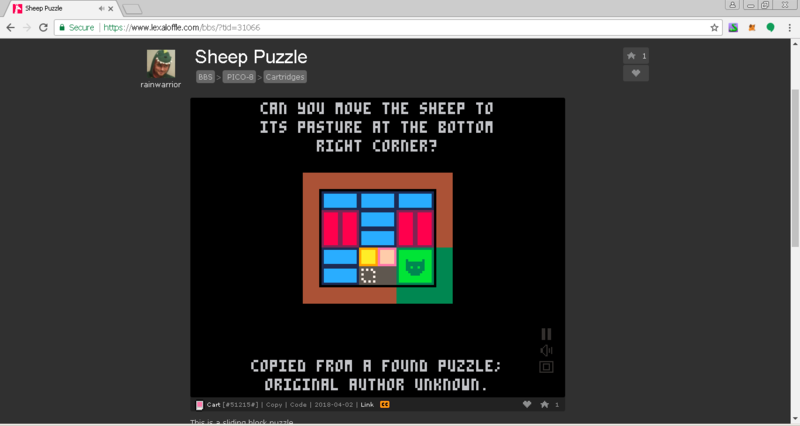 The object is to get the green 2x2 sheep block from the top left to the bottom right. The design of the game is not mine. A friend had it in their house, and did not know its origins. Presumably the puzzle has a solution, but I could not find it, so I wished to make a version I could play with. If you do solve it, let me know! This puzzle was originally patented in 1928 by J.M. Schneider. Information and patent links at Rob's Puzzle Page listed under C56 / C57. Jesus I spent way long on this than i care to admit.